Fingerprint creature drawings are a very creative and simple way to draw animals, whether real or fantasy. They can be as basic or as detailed as you want to make them. This is a good activity for anyone of any age, but is especially fun and easy for a group of children to do. It encourages creative drawing but doesn’t require that the person be overly artistic. Just use your imagination to come up with the creatures, people and animals you make with your fingerprints and a pen or pencil. Clean your hands before you start so that the fingerprints will transfer properly. Dry them thoroughly. Also make sure you clean your fingertips when you change ink colors on the same fingers so you don’t smear all the colors together. Push your finger tips lightly into the ink pad. Don’t press too hard or the fingerprints will look smeared with too much ink on your fingers, unless that is the look you are going for. Then transfer the print to the paper by pressing down on the plain paper. You may have to repeat this process a number of times for creations that take more than one finger print. 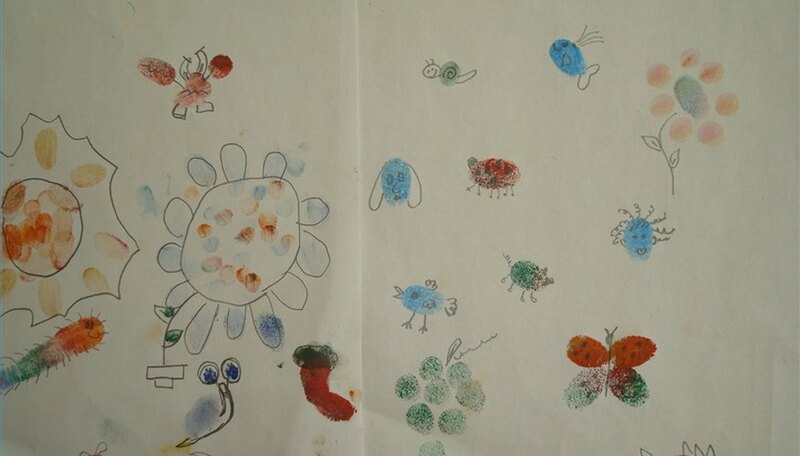 You can fill a whole sheet of paper with many different small fingerprint creatures and creations. Draw in the details of each creature using a pen or pencil. For instance draw the eyes, ears, nose, hair or any other extra feature that will complete the creature drawing. You can add as much or as little details as you want for each creature. Just be sure to add enough so people can tell what it is. These are whimsical fingerprint drawings and only take a simple technique to create and a little imagination to make. They don’t even have to be real or existing things. Just let your imagination flow. Use washable or permanent ink pads, but you may want to use the washable ones so you aren’t stuck with ink on your hands. These are also a better option for making these fingerprint creature drawings with children too. Cleanup is much easier when you use the water soluble inks. Ink pads come in a lot of different colors, including multicolored ones like rainbows. You can find them at most craft stores and office supply stores. Fill a whole sheet of paper with your creations, then share them. You can use these drawings to illustrate a story or a letter.